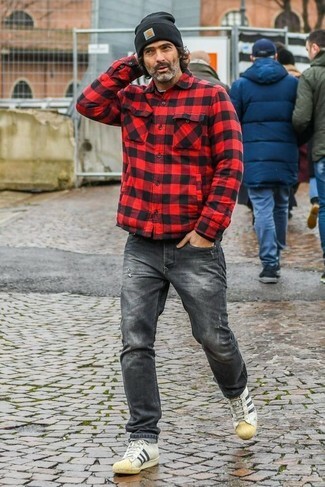 We all getup for comfort when it comes to dressing up, and this combination of a red and black check shirt jacket and a black beanie is a wonderful example of that. Rocking a pair of beige leather low top sneakers is an easy way to add extra flair to your ensemble. 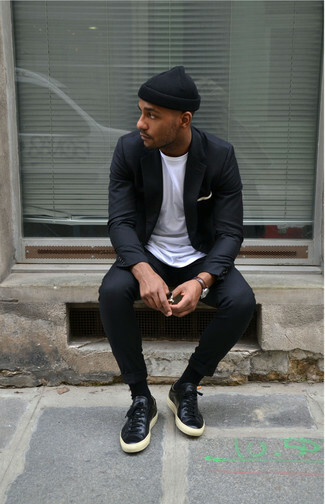 If you're all about being comfortable when it comes to dressing up, this combination of a black blazer and a black beanie is just for you. Throw in a pair of black leather low top sneakers to take things up a notch. If you prefer practicality dressing when it comes to fashion, you'll love this easy pairing of a black quilted bomber jacket and a black beanie. 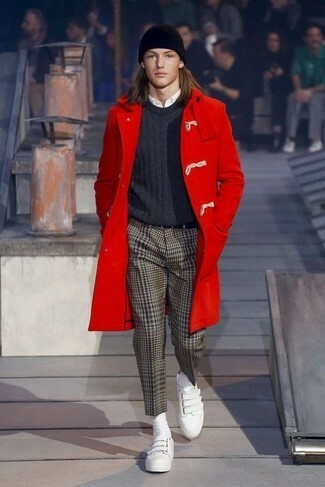 Go for a red duffle coat and a N.Peal chunky ribbed knit beanie hat to be both casual and neat. To add more class to your look, complement with white leather slip-on sneakers. If you're all about comfort dressing when it comes to your personal style, you'll love this on-trend pairing of a navy horizontal striped crew-neck sweater and a N.Peal chunky ribbed knit beanie hat. 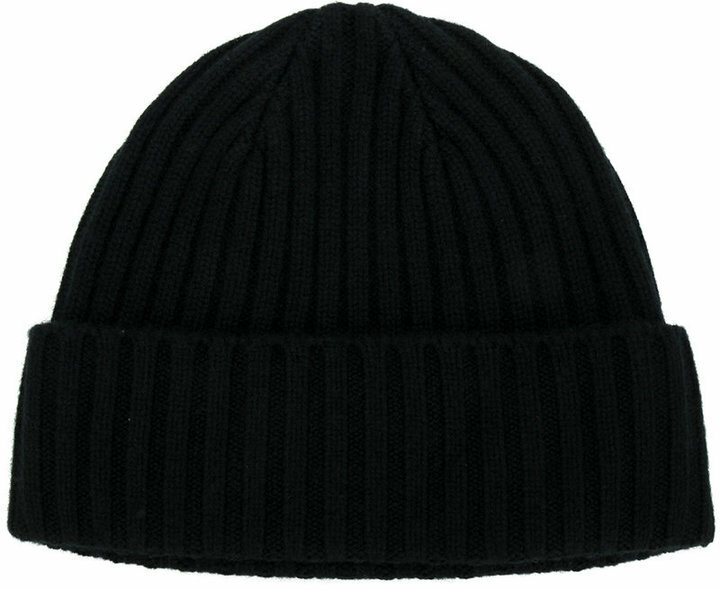 Try pairing a black leather bomber jacket with a N.Peal chunky ribbed knit beanie hat from farfetch.com for a laid-back yet fashion-forward outfit. Dark brown leather derby shoes will add elegance to an otherwise simple outfit. If you're all about relaxed dressing when it comes to your personal style, you'll love this easy pairing of a grey shearling jacket and a N.Peal chunky ribbed knit beanie hat. Up the cool of your outfit by complementing it with grey canvas low top sneakers. Try teaming a grey overcoat with a N.Peal chunky ribbed knit beanie hat for a relaxed take on day-to-day wear. 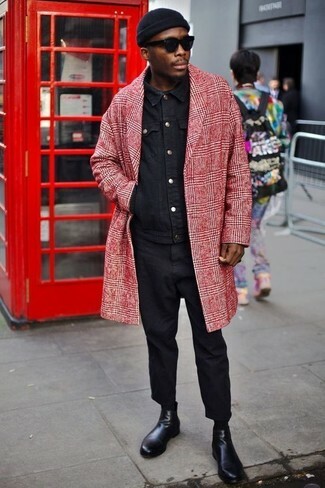 If you're all about relaxed dressing when it comes to fashion, you'll love this easy pairing of a red plaid overcoat and a N.Peal chunky ribbed knit beanie hat. To add elegance to your outfit, finish off with black leather chelsea boots.